Using a T-shirt to access the Internet sounds pretty far out to me. C'mon, that's as unlikely as being able to (what's the cool word all the kids use?) surf the Web on a cellular phone or some sort of portable tablet-like device. 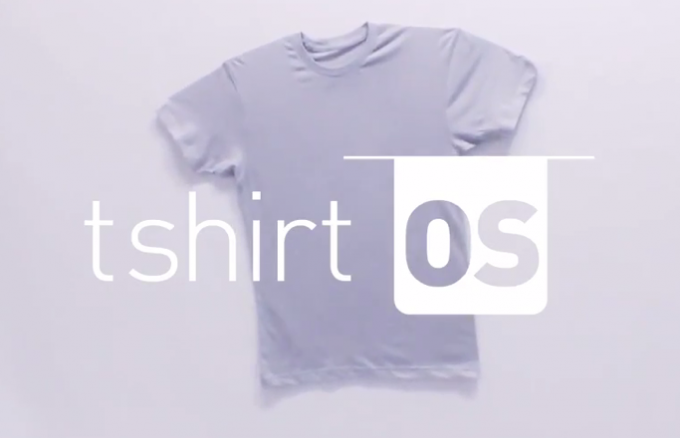 But the prototype of an Internet-enabled, 100 percent cotton T-shirt does exist, complete with a 1024-pixel LED screen, a headphone jack to share songs from iTunes and a tiny digital camera. London fashion house CuteCircuit, which specializes in futuristic (what's that hip word I'm hearing everywhere?) threads, handled the shirt design as part of the "Leave an Impression" campaign for Ballantine's whisky. In clips produced by Work Club, tshirtOS is touted as the logical digital extension of the classic tee, which is itself described as "the original canvas for personal expression." (That's so true! I've worn only "Keep on Truckin" shirts since '79.) The launch video has almost 500,000 YouTube views in a month, but the follow-up, called "T-Shirt of the Future," with more than 1.3 million views, is the real gem. It follows the sublimely silly, somewhat surreal adventures of two dweebs who take tshirtOS out for a night on the town. It plays like a retro-cyber mashup of Weird Science, Max Headroom and The Young Ones, '80s references I'm sure are instantly familiar to all. (Anthony Michael Hall deserved an Oscar. He was robbed!) Will such a fantastical shirt ever be mass produced? If it is, I'll take an XXL—which isn't my size but my bandwidth preference.